Bright-eyed American stars and British unknowns converged at the BAFTA Awards on Sunday night at London’s Royal Opera House. 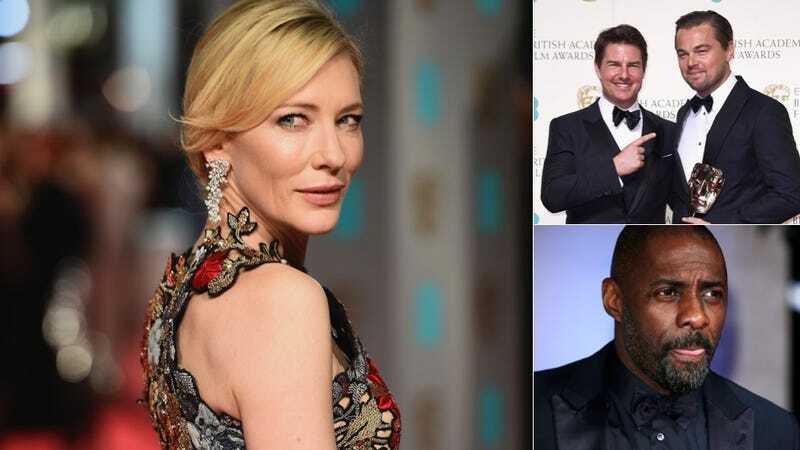 Cate Blanchett surveyed her kingdom, Tom Cruise resumed his mission to lure Leonardo DiCaprio to Xenu’s sanctuary, and Idris Elba... yes. More beautiful and confounding outfits below. Rebel Wilson is dressed for a job interview that went poorly. She didn’t get the job :(. Kate Winslet wore a pretty but uneventful off-the-shoulder look. Laura Haddock, who’s been in several movies you definitely have seen, is floating in a black Christmas tree. Daring. Cate Blanchett once again came through in decadent, embroidered Alexander McQueen that’s both questionable and show-stopping. Actress/model Dree Hemingway’s gown might appeal better without the severe turtleneck. Dakota Johnson pulls off this lightly draped Dior number. Emilia Clarke, not so much. John Boyega’s chocolate Armani tuxedo makes me as happy as he seems. Michael Fassbender’s just kinda standing there, brooding. The fit on Will Poulter’s tuxedo is is swank, but what have I seen him in? This is Laura Whitmore in something a soap opera star would wear to a gala. Isla Fisher played it safe but elegant. Alicia Vikander kills it in Louis Vuitton. Valentino brought the opera to the opera house and Benicio del Toro can do no wrong. Adewale Akinnuoye-Agbaje looks as spiffy as a Fortune 500 CEO. Leo could stand to add texture or something to his suits, but he rarely goes bold, instead opting for classic. Here’s our future little Oscar winner in a standard tuxedo. Winslet and Fassbender, cool kids. Ah, this person! He looks fine. The typically dapper Bryan Cranston went awry in velvet. And oh, it’s Taron Egerton and Tom Hooper. Those guys. Stacy Martin (“the younger version of Charlotte Gainsbourg’s character Joe in Lars von Trier’s drama film Nymphomaniacs”) is a sweet porcelain doll plotting to maim you, and Gwendoline Christie’s dress wins in a weird way. Fleur de Force is a YouTube star wearing something I wouldn’t. Angela Scanlon looks so much like Angela Scanlon it’s scary, which is to say, great. Antonia Thompson is stunning. Icelandic actress Heida Reed is almost unrecognizable. Idris Elba always looks Would. Cuba Gooding Jr. always doesn’t. I always wanna watch Ex Machina, but seeing Domhnall Gleeson makes me really wanna watch it. Wear Julianne Moore’s dress to a cool holiday party, Carrie Fisher’s to a business conference in Utah and Angela Bassett’s to a super extravagant parent-teacher conference.